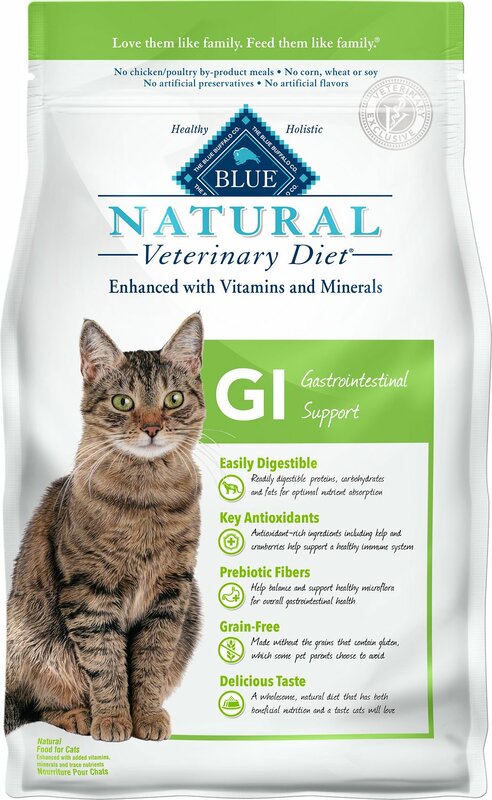 Feed your feline friend the finest natural ingredients featured in Blue Buffalo Natural Veterinary Diet GI Gastrointestinal Support Grain-Free Dry Cat Food. Made with easily digestible ingredients from proteins, carbohydrates and fats to promote your pal’s optimal nutrient absorption. 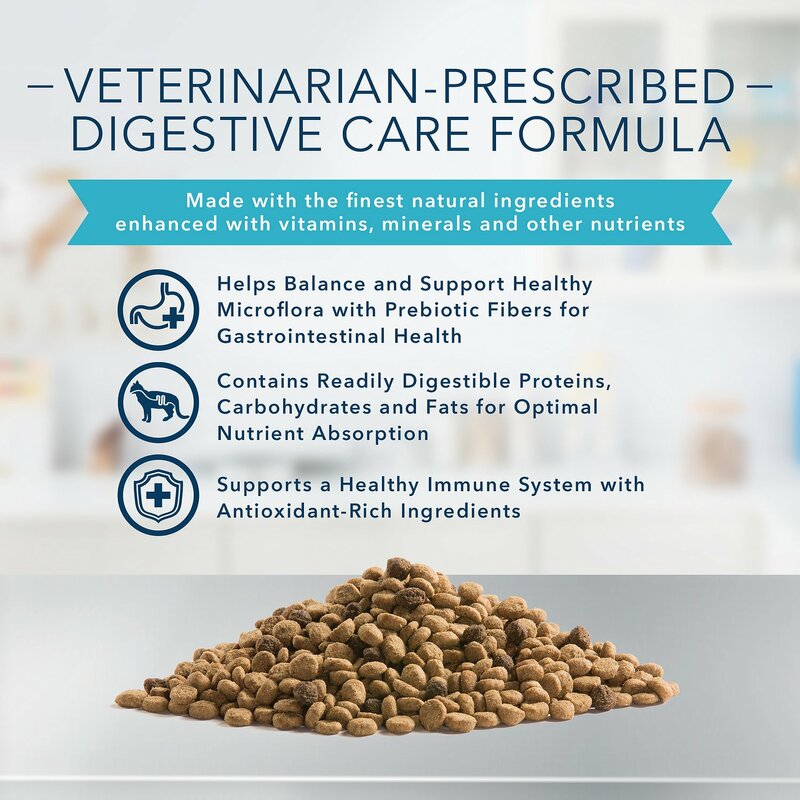 The veterinary diet contains prebiotic fibers to help balance and maintain your furry friend’s healthy GI microflora. The healthy holistic formula contains vitamins E and C, and antioxidant-rich ingredients including blueberries and cranberries to help support a healthy immune system. Plus, this wholesome, grain-free natural diet has both beneficial nutrition and a taste your furry pal will love. Contains vitamins E, C, along with antioxidant-rich ingredients such as blueberries and cranberries to support a healthy immune system. A wholesome, natural diet made with the finest ingredients available that have both beneficial nutrition and a taste your furry friend will love. Deboned Chicken, Chicken Meal, Tapioca Starch, Peas, Pea Protein, Turkey Meal, Dried Egg Product, Chicken Fat (preserved with Mixed Tocopherols), Flaxseed (source of Omega 3 and 6 Fatty Acids), Pea Fiber, Natural Flavor, Potatoes, Apple Pomace, Pumpkin, Potassium Chloride, DL-Methionine, Cranberries, Choline Chloride, Calcium Sulfate, L-Threonine, Dried Kelp, Dried Chicory Root, Dehydrated Alfalfa Meal, Calcium Chloride, Alfalfa Nutrient Concentrate, Taurine, Calcium Carbonate, Salt, L-Tryptophan, Vitamin E Supplement, Sweet Potatoes, Carrots, preserved with Mixed Tocopherols, Iron Amino Acid Chelate, Zinc Amino Acid Chelate, L-Ascorbyl-2-Polyphosphate (source of Vitamin C), Vegetable Juice for color, Niacin (Vitamin B3), Copper Amino Acid Chelate, Blueberries, Barley Grass, Parsley, Turmeric, Yucca Schidigera Extract, Manganese Amino Acid Chelate, Thiamine Mononitrate (Vitamin B1), L-Lysine, Biotin (Vitamin B7), Vitamin A Supplement, Pyridoxine Hydrochloride (Vitamin B6), Calcium Pantothenate (Vitamin B5), Riboflavin (Vitamin B2), Ferrous Sulfate, Zinc Sulfate, Vitamin D3 Supplement, Vitamin B12 Supplement, Folic Acid (Vitamin B9), Copper Sulfate, Dried Yeast, Dried Enterococcus faecium fermentation product, Dried Lactobacillus acidophilus fermentation product, Dried Aspergillus niger fermentation extract, Dried Trichoderma longibrachiatum fermentation extract, Dried Bacillus subtilis fermentation extract, Manganese Sulfate, Calcium Iodate, Sodium Selenite, Oil of Rosemary. Feed dry for crunchy & delicious nutrition nuggets & LifeSource Bits right from the bag, or add warm water and mix to fully release flavors & aroma. 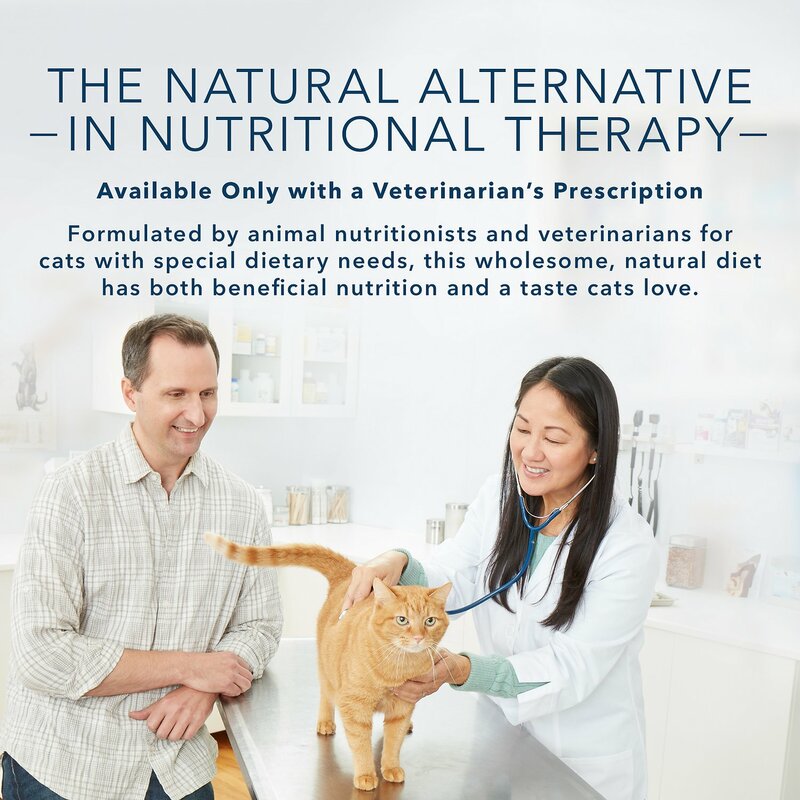 With veterinarian approval, cats should be gradually transitioned from their old food to Blue Buffalo Natural Veterinary Diet. Start by mixing 25% of Blue Buffalo with the cat's old food, and gradually increase the proportion of Blue Buffalo food over the next 14 days. My Midnight loves this and cannot get enough of it. She has IBS plus kidney disease so she gets two cans of specific prescription wet food but this is a perfect little snack to hold her over in between meals. She licks her bowl clean. Highly recommend. 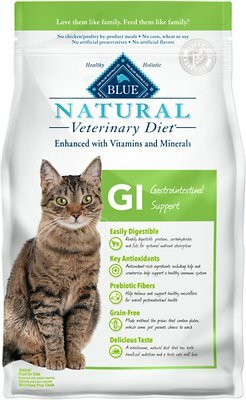 My cat has GI issues and will have explosive diarrhea (not pleasant). Have had her on another brand's vet line for GI trouble plus prednisolone and her poo was better but never solid. Discussed with my vet and decided to give this a try. Within 2 weeks, her poo is solid and normal! I like that it doesn't have the corn, wheat and soy that other products contain. 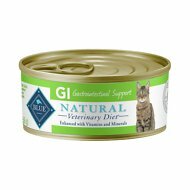 My cat has been placed on GI formula food and I have been trying to find one which has larger pieces since she seems to prefer them. She seems to eat this okay, but if there is any other larger pieces of food around she will eat them first. I have one cat who always vomits after eating. Checked with my vet decided worth a try, so far so good. She likes the food and eats readily, have to be careful not to feed too much at one time. Overall great improvement. My 14 year old cat was losing weight and vomiting every day. All her blood work came back normal. Switched to this food and she has gained weight and is doing great. She loves it. Seems to be helping my cats sensitive stomach problems. Need to keep feeding for a longer period of time to see the total effects. The diarrhea has stopped within a week of this diet!